Are These Common Website Myths Hurting You? Everyone loves to give advice. But the truth is: some advice is bad...really, really bad. When it comes to websites, everyone has an opinion. There are thousands of best practices articles published daily. Yet somehow, bad web design advice keeps getting circulated. To help you figure out who to listen to, we've compiled some of the website myths we hear most often and provided some advice you can feel good about taking. Myth #1: You don’t need to change the content – that’s what copy and paste is for! That’s just not true. For Google’s sake, but more importantly, for your reader’s sake, make your content original, every time! Google isn’t the one setting the precedent here. Remember high school? One of the biggest no-nos in every handbook is plagiarism. And while you may have written the original copy you’re thinking of duplicating, copying and pasting the same content on multiple pages is just as bad as plagiarism in Google’s all-knowing eyes. If the same content is written verbatim across the web, how will Google know who the true authority or originator is? And with Google, authority is a pretty big deal. So don’t do it. Just don’t. Myth #2: You don’t need a mobile-friendly site – as long as it’s desktop-friendly, you’re good to go! 2014 texted; it wants to know where the hell you’ve been! In this day and age, no one goes anywhere without their cell phone. And one of the easiest ways to deter potential customers is to have a non mobile-friendly site that doesn’t look great and function well on their iPhone or Android. This is a nation full of on-the-go-people and if we have to go home to his desktop computer to find out where you’re located, what your phone number is, what your hours are, or what you can do for me, you can forget about having us clients. #sorryimnotsorry. Myth #3: Any review is a good one – even a fake one! Repeat after me: I WILL NEVER WRITE A FAKE REVIEW FOR MY COMPANY ANYWHERE. Good, because you’re not fooling anyone. We’ve heard of an unbelievable number of business owners writing fake positive reviews for their businesses, and it’s really just sad and wasteful. Even if you think you’re being incredibly sly about your review, chances are, you’re not fooling me or Google. Instead, use your time to really “wow” your customer, make reviews easy for them (for example, send them a reminder email with links to review sites), and they’ll do the job for you. Myth #4: You don’t need to ask for reviews. You’ll get them. This one is partially true. If your customer had a horrible experience with you, you can bet that she will put in the time and effort to plaster it across the web. Her Facebook status will announce your shortcomings; Twitter will have 140 characters of disappointment in you; and she’ll drag you through the dirt on Google+ and Yelp. But as sad as it is, we humans aren’t as eager to share the good. So if you outshine your competitors on the job, remind your client how much your business relies on satisfied customers to spread the good news and cheer. If you remind them how important their opinion is to you, they’ll be more willing to put in the time to spread the word. After all, who doesn’t like feeling important? Myth #5: Your phone number doesn’t need to be on every page – just make sure it’s listed on the contact page. Think back to the mobile-friendly thing: we’re a nation of impatience. Rumor on the web is that you’ve got an incredibly short amount of time to give your potential client what they want. 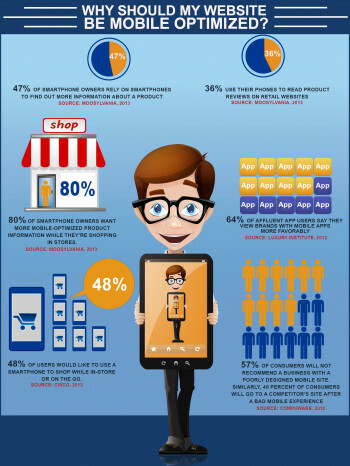 And most mobile users are looking to find you or contact you right then and there. If they have to navigate your entire site in order to reach you, they won’t. It’s easier to just click “back” and hope that the next site in the search results has its contact info right there in plain sight. Myth #6: Any website is better than no website! Most of your customers, especially millenials, will be incredibly shocked and disappointed if you don’t have a website. That being said, if you do have a website and it looks like it was made right around the time AOL was launched, these same millenials are probably going to judge you negatively. Yes, websites can be costly. But even if you have to keep it incredibly simple, make sure your site is aesthetically pleasing, concise and informative, and easy to navigate – because if it’s not, you might as well not have one. Seriously. Myth #7: Team photos and bios aren’t really that important. This one might not seem like that big of a deal, but it really is. The web is littered with service businesses, and you can make anyone look good with a big budget and good marketing. So how will you set yourself apart? Unless you’re selling something incredibly unique, you need to stand out as a business, as a culture, as a brand. Gathering up team photos and bios may seem tedious to you as a business owner, but it’s a really simple way to link faces and feelings to your brand. One friendly smile or common interest between your potential client and one of your employees may be what it takes to put you over your competitor in your potential client’s eyes. Truthfully, there’s a lot of bad advice out there – much more than we have time for here. But even bad advice can make you think. So take what you can and do what makes sense to you as both a business owner and a consumer. If you truly care about your customers and have their best interest at heart, you’ll probably be making wise choices for your company across the board, anyway.